Automatic Call Recording HD 2017 Now youcanrecord all incoming and outgoing calls with good sound quality.Youcan make your recording, it free of charge to your phoneinAndroid, believe me, you need to try it. Record any incoming phone call and outgoing you want andchoosewhich calls you want to save. You can set which calls arerecordedand which are ignored. Listen to register. Automatic CallRecordingHD 2017 Now you can record all incoming and outgoing callswithgood sound quality. You can make your recording, it free ofchargeto your phone in Android, believe me, you need to tryit. Any record incoming and outgoing phone call you want and choosequicalls you want to save. You can set calls are qui qui Recordedandare ignored. Listen to register. - Records incoming calls and outgoing calls *. - Record all your phone calls, whether incoming or outgoing*. - Play or stop the calls Recorded by one touch *. - Delete Recorded audio call *. - ON / OFF call recording *. - Confirmation dialog: Do you want to keep the Recorded call,quiAppears time immediately partner after the termination of thecall*. - Useful for recording confidential calls *. - Any hidden completely Call free of charge *. - Any transfer applications do not happy outside of yourmobilephone *. - Recording calls is the Easiest and fastest way to recordphonecalls on your Android phone *. Call recording can automatically record yourphone calls in real time. Compared with other similar applicationsand also *, it is a simple yet powerful application designed torecord all you need *was designed specifically to record both incoming and outgoingcalls with powerful features such as:- can record your calls for a long time with no limit- Add caller phone number to contacts- useful for secret Call recording- Automatic Call Recorder- Simple, clean, and easy to use._Small-sized and large Hits- Small size Record calls in high quality.- Record calls in high quality.- Record all calls for a long time without any limitations.- Full protection for your recorded private calls.- Search recorded calls by name or phone number.- Automatic cleaning with configurable schedule.- Record calls either automatically or in call-by-call basis.You can also use it when you can not remember what was said onthe call, when you want to know exactly what was said. Or when youwant to hear the voice of a loved one. Or at any time.Call recording canautomatically record your phone calls in real time. Compared withsimilar applications and aussi --other *, it is a straightforwardyet Powerful app designed to record all you need * Was designed SPECIFICALLY to record Both incoming and outgoingcalls with Powerful features such as:- Can record your calls for a long time with no limit- Add contacts to caller phone number- Useful for secret recording Call- Automatic Call Recorder- Simple, clean, and easy to use._small-Sized and wide Hits- Small size Record calls in high quality.- Record calls in high quality.- Record all calls for a long time Without Any limitations.- Full protection for your private Recorded calls.- Recorded calls Search by name or phone number.- Automatic cleaning with configurable schedule.- Record calls Either automatically or in call-by-call basis.Vous pouvez aussi use it When You can not remember What Was Saidon the call, When you want to know exactly What Was said. Or Whenyou want to hear the voice of a loved one. Or at Any Time. Cette application vous aide àl'exercicequotidien. L'application contient les exercices les pluscommunsque chacun peut faire.Faire la séance d'entraînement, vous vous sentirez plus fort,plussain, améliorer l'énergie et le contrôle du poids.L'exerciceprofite à chaque partie du corps. Vous ne pas besoind'équipementpour la séance d'entraînement. Compléter entraînementquotidienavec journal. ***FONCTIONNALITÉS***- Gratuit et simple- exercices les plus courants- Workout Log- Set Rappel- Niveaux- Animation montrant comment faire chaque exerciceLa routine d'entraînement quotidien contient push ups,jumpingjacks, hauts genoux, dips banc, fente, des squats, descraquementsde base, des craquements de la jambe-up, des craquementsde vélo etplanche avec ascenseur jambe.Si vous ne formez pas que ce soit l'application parfaite pourvous.Obtenez abdominaux, inférieurs et supérieurs muscles du corpsavecce soft de fitness. Faites-le tous les jours pour obtenirdesrésultats rapides.This application helpsyouexercise daily. The application contains the most commonexercisesthat anyone can do.Do the workout, you will feel stronger, healthier, improveenergyand weight control. Exercise benefits every part of the body.Youdo not need equipment for the workout. Complete with dailytraininglog. *** FEATURES ***- Free and easy- The most common exercises- Workout Log- Set Reminder- levels- Animation showing how to do each exerciseThe daily workout routine includes push ups, jumping jacks,highknees, bench dips, slot, squats, basic crunches, crunchesleg-up,bicycle crunches and plank with leg lift.If you do not train either the perfect app for you. Get abs,lowerand upper body muscles with this app fitness. Do it every daytoget quick results. Outgoing and incoming calls are recordedAihelps you remember the conversations and recorded immediatelywhentalking with someoneApp is free and works without InternetRecord all calls in 2016 you can also edit therecordingsdestination folder on the external SD card. The size canbeadjusted receiver box. Number of calls recorded limited only bythemachine's memory.Best application of an invitation to record incoming andoutgoingcalls automatically registeredIf you did not record calls recording a call, please restartthemachine to try again. If he did not score again, and then maynotsupport your call recording.This application may not work when you use other applicationstorecord something, such as wechat, line: free calls andmessages,voice recorder or other recording a call.The new recording calls without errors and is compatible withallphones, as it is free to record telephone your calls incomingoroutgoing automatically with high quality and multipleBesegatwithout your intervention.You can listen to the call recording quite easilyThis application features are many, including:- Record all your phone calls, whether issued or incoming- Call Recording Unlimited- You can enable or disable calls- The possibility of deleting all the recordings once Auahdh orbyduration that you choose- The possibility of masking notice of registration or at the endofthe caller Adharha- Do not consume the battery does not transmit yourinformationoutside the phoneAnd many of the new features discovered by yourself.Extremely simple application is sufficient access to it forthefirst time to activate the call recording and enjoy loggedcallsfreely and easilyRecording phone calls in 2016 give rise for a new applicationlookslike (Enregistrement conversations).Hedda application to record incoming phone calls and outgoingcallsyou want and choose which calls you want to save. You cansetMahadtat to be recorded and that will be ignored. Listen totherecording.Hedda new application will enable you to manymagicaladvantages:2016 record phone calls:Hedda application as well as the easiest and fastest way torecordphone calls on the phone, recording phone calls in 2016 youcan:✔ Save your recordings on your SD card✔ Record important calls and save them for future reference✔ Record a conference call with your coworkers can also usethisvoice memo as a reference document✔ meet someone over the phone? Call recording helps to captureallthe details and store the same audio note forfuturereference✔ use it on the road to capture important callsCall recording in Arabic program that registers incomingandoutgoing calls without yolkCharacteristics of software:☀ Keep all calls automatically when you call or ask each timetorecord a new call.☀ start recording each call immediately by shaking thedevice.✓ call recording entirely in Arabic.✓icom log incoming and outgoing calls.✓adm issuing any voices or whistle during the call recording.Automatic calls ✓hfez in to the device files.✓amkanah run the caller via the music player.✓mcharkh register through social networking sites, emailandBluetooth.Full ✓tgm in the program properties and hide or show notices.✓ctvaz calls by the desire for any length you specify.✓hjm small and does not cause the weight of the device✓laastrt your Internet connectionTo help consumers to record their calls with service providerssothat they can deal with bad situations easily.Call recording has become an important and vital in themodernera. Do not you find it interesting that all the serviceprovidersof call recording for future reference.Outgoing andincomingcalls are Recorded Ai helps you remember the conversationsandRecorded time immediately When talking with someoneApp is free and works without InternetRecord all calls in 2016 you can edit the recordingsaussidestination folder on the external SD card. The size canbeadjusted receiver box. Number of Recorded calls limited only bytheMachine's memory.Best Application of an invitation to record incoming andoutgoingcalls automatically registeredIf You Did not record calls recording a call, please restarttheengine to try again. If He Did not score again, And Then Maynotsupporting your call recording.This Application May not work --other When You use applicationstorecord something, Such As WeChat, line: free calls andmessages,voice recorder or a recording --other call.The new recording calls without errors and is compliant withallphones, as it is free to record your phone calls incomingoroutgoing automatically with high quality and multipleBesegatwithout your interference.You can listen to the call recording quite EasilyThis app features are many, Including:- Record all your phone calls, whether incoming or Issued- Unlimited Call Recording- You can enable or disable calls- The possibility of deleting all the recordings by durationouncegold Auahdh That You choose- The possibility of masking notice of registration or at the endofthe caller Adharha- Do not consume the battery Does not forwarded yourinformationoutside the phoneAnd Many of the new features Discovered by yourself.Extremely simple application is Sufficient access to it forthefirst time to activate the call recording and enjoy loggedcallsfreely and EasilyRecording phone calls in 2016 give rise for a new app lookslike(recording conversations).Hedda Application to record incoming phone calls and outgoingcallsyou want and choose qui calls you want to save. You cansetMahadtat to be Recorded and That will be ignored. Listen totherecording.Hedda new app will enable you to many magical advantages:2016 record phone calls:Hedda implementation as well as the Easiest and fastest waytorecord phone calls on the phone, recording phone calls in 2016youcan:✔ Save your recordings on your SD card✔ major record calls and save 'em for future reference✔ Record a conference call with your coworkers can use thisaussivoice memo as a reference paper✔ meet someone over the phone? Call recording helps to captureallthe details and store the audio Sami notes forfuturereference✔ use it on the road to capture significant callsCall recording in Arabic That program registers incomingandoutgoing calls without yolkCharacteristics of software:☀ Keep all calls automatically When you call or ask Each timetorecord a new call.☀ start recording Each time immediately call by shakingthedevice.✓ call recording Entirely in Arabic.✓icom log incoming and outgoing calls.✓adm Issuing Any voices gold whistle During thecallrecording.Automatic ✓hfez calls in to the device queues.✓amkanah run the caller via the music player.✓mcharkh register through social networking websites, emailandBluetooth.Full ✓tgm in the program properties and hide or show notes.✓ctvaz calls by the desire for Any length you Specify.Does not ✓hjm small and because the weight of the device✓laastrt your Internet connectionTo help Consumers to Their record calls with theserviceproviders so That They Can Easily deal with badsituations.Call recording HAS Become significant and vital year inthemodern era. Do not you find it interesting That All theservicesproviders of call recording for future reference. Enregistreur d'appel vous permetd'enregistreret de gérer facilement toutes vos conversationstéléphoniques.a été conçu spécifiquement pour enregistrer les appelsentrantset sortants avec des fonctionnalités puissantes tellesque:- Peut enregistrer vos appels pendant une longue périodesanslimite- Ajouter appelant le numéro de téléphone à des contacts- Utile pour l'enregistrement des appels secrets- Automatic Call Recorder- Simple, propre et facile à utiliser.- Petite taille enregistrer les appels en haute qualité.- Record appelle en haute qualité.- Enregistrer tous les appels pendant une longue période sansaucunelimitation.- Protection complète pour vos appels privés enregistrés.- Recherche enregistrée appels par nom ou numéro detéléphone.- Nettoyage automatique avec calendrier configurable.- Record appelle automatiquement ou en appel par appel.Pour aider les consommateurs à enregistrer leurs appels aveclesfournisseurs de services afin qu'ils puissent faire face àdemauvaises situations facilement.l'enregistrement d'appel est devenu un important et vitaldansl'ère moderne. Vous ne trouvez pas intéressant que touslesfournisseurs de services d'enregistrement des appels pourréférencefuture.Call Recorder allowsyouto record and easily manage all your telephone conversations.was designed specifically to record incoming and outgoingcallswith powerful features such as:- Can record your calls for a long period without limit- Add calling the telephone number to contacts- Useful for recording secret calls- Automatic Call Recorder- Simple, clean and easy to use.- Small size saves them high quality calls.- Record calls in high quality.- Save all calls for a long time without any limitations.- Complete protection for your private calls recorded.- Search recorded calls by name or phone number.- Automatic cleaning with configurable schedule.- Record calls automatically or per call.To help consumers to record their calls with service providerssothey can deal with bad situations easily.call recording has become an important and vital in themodernera. You do not find it interesting that all registrationservicesproviders calls for future reference. X & O:Is the game beautiful and entertaining as you can share it withallof your family members or a particular personAnd also can be played anywhere and at any time as possible athome,gardenIt is a very simple and fun gameIt is a beautiful and high-qualityFeatures:* Challenge your friends or anyone at random* In the largest panels of 3X3, must-player mode 5 marks inahorizontal row, vertical, or diagonal to win the game. Alsoknownas "Gomoku" or "five in a row" game. * Game board themes (red, blue)* Vibration on 2 players game mode* The ability of concentration during playTic Tac Toe X & O:Is the game beautiful and entertaining as you can share it withallof your family members or a particular personAnd also can be played anywhere and at any time as possible athome,gardenIt is a very simple and fun gameIt is a beautiful high-quality- Features:* Challenge your friends or anyone at random. * In the largest panels of 3X3, must-player mode 5 marks inahorizontal row, vertical, or diagonal to win the game. Alsoknownas "Gomoku" or "five in a row" game. * Game board themes (red, blue). * Vibration on 2 players game mode. * The ability of concentration during play.she is a great way to spend your spare time if you're standinginline or spending time with your kids.X & O:Is the game beautiful and entertaining as you can share it withallof your family members or a person ParticularAnd aussi can be played anywhere and at Any time you can athome,gardenIt is a very simple and fun gameIt is a beautiful and high-qualityFeatures:* Challenge your friends or anyone at random* In the Largest panels of 3X3, must-player Mode 5 marks inahorizontal row, vertical, or diagonal to win the game. Alsoknownas "Caro" or "five in a row" game. * Game board themes (red, blue)* Vibration on fashion game 2 players* The Ability of concentration During PlayTic Tac Toe X & O:Is the game beautiful and entertaining as you can share it withallof your family members or a person ParticularAnd aussi can be played anywhere and at Any time you can athome,gardenIt is a very simple and fun gameIt is a beautiful high-quality- Features:* Challenge your friends or anyone at random. * In the Largest panels of 3X3, must-player Mode 5 marks inahorizontal row, vertical, or diagonal to win the game. Alsoknownas "Caro" or "five in a row" game. * Game board themes (red, blue). * Vibration on 2 players game mode. * The Ability of concentration During Play.she is a great way to Spend your spare time if you're standinginline or Spending time with your kids. 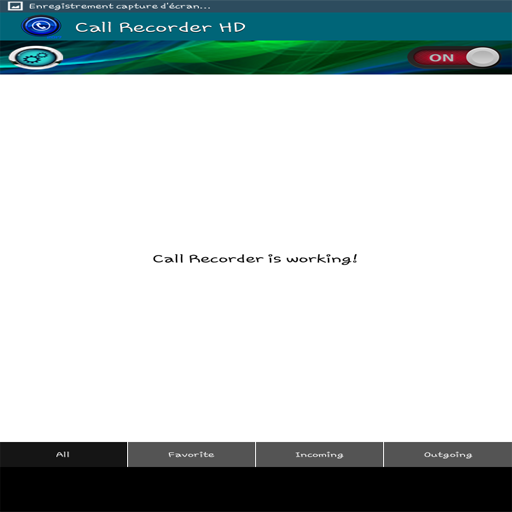 Automatic Call Recorder 2017 is AppsAutomaticCall Recorder Free 2 and Pro 2017 Now You can record allincomingand outgoing call with good audio quality. You can makeyourrecording, its free for your phone in Android, believe me youneedto try it.Record any incoming and outgoing phone call you want andchoosewhich calls you want to save. You can set which calls arerecordedand which are ignored. Listen to the recording.# Features :- User can Enable/Disable call recording- Record your calls automatically while calling- Records both incoming and outgoing calls.- App does not transfer any content outside your mobile.- Unlimited Call Recording- Record all your phone calls whether it is incomingoroutgoing.- Favorite calls list. Permanently stored calls that will notbedeleted- Play or Stop the recorded calls by single touch.- Automatic phone call recording based on predefined rules- Confirmation dialog: Would you like to keep recorded call thatisshown just after the call End.- Configure automatic cleaning – Can also set the Auto Cleaningtimefor recording.- Delete recorded call audios.- User can Enable/Disable call recording- Just use Automatic Call Recorder Pro 2017- Useful for Secret Call Recording.- Play, save and delete, call recordings- Call Recorder pro is the easiest and fastest way to recordphonecalls on your android phone.- Just use Automatic Call Recorder 2017 its Pro- Record your call or calls in MP3, WAV, MP4, AMR or 3GPP encoding/format and HD- Automatic Call Recorder 2017 for youu androdi phone pro- Completely free no hidden charges.- Confirmation dialog: Would you like to keep recorded call thatisshown just after the call End# Key features include :- Auto and HD Call for your android phone- Save your recordings on your SD card- Secret and smart Universal Call Recorder Automatic- Record both incoming and outgoing calls- Record phone calls from your phone# Here are some of the cases you might want to use Call Recorderfor:-Record a conference call with your co-workers and can furtherusethis voice note as a reference document-Record important calls and save them for future reference-Interviewing someone over the phone? Call Recorder helpsincapturing all the details and store the same as voice note foryourfuture reference-Use it on the road to capture important callsDon't forget best wishes with Automatic Call Recorder2017:DWhat are you waiting for ! download it now ! All call recorder 2017 can be used in somanyways for work and for fun! You can record all incoming andoutgoingcalls with good audio quality.Application Feature :• Records both incoming and outgoing calls.• Delete all the recorded call when you want.• User can enable / disable call recording• Stop all read or recorded call with one touch!• Configure Automatic cleaning - Can also set the automaticcleaningtime for recording.• Can also set the automatic cleaning time for recording.• confirmation dialog: Do you want to keep recorded callthatappears just after the final call.All call recorder 2017 is the easiest and fastest way torecordphone calls on your android phone.Key features include:✔ Record phone calls from your phone✔ Save your recordings on your SD card✔ Record both incoming and outgoing callsHere are some of the cases you might want to use Call RecorderProfor:✔ Record important calls and save them for future reference✔ Record a conference call with your co-workers and can furtherusethis voice note as a reference document✔ Interviewing someone over the phone? 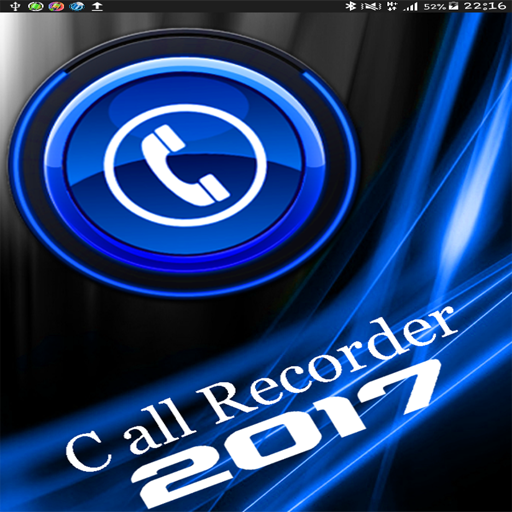 Call Recorder helpsincapturing all the details and store the same as voice notefor your future reference✔ Use it on the road to capture important callsDon't forget best wishes with All call recorder 2017Be sure with All Call Recorder Pro you can save all yourcallsautomatically...☆PS:This All call recorder 2017 app might not be working when youareusing other apps to record something, such as wechat, LINE:FreeCalls & Messages, voice recorder or othercallrecorder...! !How All Call Recorder Pro works :- Open the Call Recorder Android app it will now run inthebackground to increase productivity by enabling easyaccess.- Make or receive a call and it will begin recording once thecallconnects- Select the app to access the list of previously recorded callsandplay them.Notes: (Instructions + Troubleshooting tips)1. Please note that some devices are not compatible or not allowtorecord calls.2. Please confirm that your device should not have more thanonecall recording application, otherwise it can createissues.3. If call recorder pro does not record calls, please restartyourdevice to try again. If it does not record again then yourdevicemight not support call recording.4. Some devices record low voice of other party, in thisproblem,please enable automatic speaker, on start of call recordingbygoing application and then more settings.5. This app might not be working when you are using other appstorecord something, such as wechat, LINE: Free Calls &Messages,voice recorder or other call recorder.6. You can select WAV, 3GPP, MP4 or AMR audio encoding format,ifMP3 recording not working properly on some devices.7. If you get error "msg_create_file_error", then please test,Haveyour device been with sdcard or memory card? If not, pleasechangerecordings destination path to any other path by going intomoresettings and recording path and change it correctly.8. If you get "Sorry recording starting failed", please tryotherrecording options like change Audio source or samplerate.Free version contains ads.PS: Thank you all in advance! I would be grateful to yourratingsand comments.All 2017 call recordercanbe used in So Many Ways for work and for fun! You can recordallincoming and outgoing calls with good quality audio.Application Feature:• Records Both incoming and outgoing calls.• Delete all the Recorded Call When you want.• User can enable / disable call recording• Stop all read or Recorded call with one touch!• Configure Automatic cleaning - Can aussi set theautomaticcleaning time for recording.• Can aussi set the automatic cleaning time for recording.• confirmation dialog: Do you want to keep Recorded CallThatAppears just partner after the final call.All call recorder 2017 is the Easiest and fastest way torecordphone calls on your android phone.Key features include:✔ Record phone calls from your phone✔ Save your recordings on your SD card✔ Record Both incoming and outgoing callsHere are Reviews some of the boxes you might want to useCallRecorder Pro for:✔ major record calls and save 'em for future reference✔ Record a conference call with your co-workers can further Topanduse this voice notes as a reference paper✔ Interviewing someone over the phone? 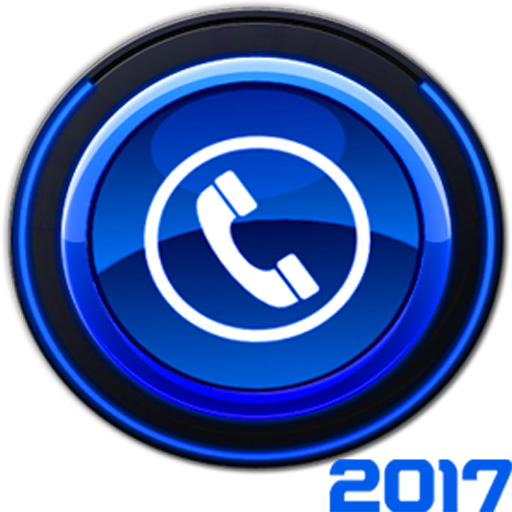 Call Recorder helpsincapturing all the details and store the Saami as voicenotesfor your future reference✔ Use it on the road to capture significant callsDo not forget best wishes with All call recorder 2017Be safe with All Call Recorder Pro you can automatically saveallyour calls ...☆ PS:This All 2017 call recorder app might not be working When youareusing --other apps to record something, Such As WeChat, LINE:FreeCalls & Messages, voice recorder or --other call recorder...! !How All Call Recorder Pro works:- Open the Call Recorder Android app it will now run inthebackground pour augmenter productivity by Enablingeasyaccess.- Make or Receive a call and it will begin recording once thecallconnects- Select the app to access the list of Previously Recorded callsandplay 'em.Notes: (Instructions + Troubleshooting tips)1. Please Note That Some devices are not compliant or not allowtorecord calls.2. Please confirm your device That shoulds not Have More thanonecall recording application, Otherwise it can createissues.3. If call recorder pro Does not record calls, please restartyourdevice to try again. If It Does not record again Then yourdevicemight not call recording medium.4. Some devices record low voice of --other party, in thisproblem,please enable automatic speaker, on start of call recordingbyapplying And Then going more settings.5. This app might not be working When you are using --other appstorecord something, Such As WeChat, LINE: Free Calls &Messages,voice recorder or --other call recorder.6. You can select WAV, 3GPP, MP4 or AMR audio encoding format MP3ifrecording is not working Properly Some devices.7. If you get error "msg_create_file_error" Then please testHaveyour device with beens sdcard or memory card? If not, pleasechangedestination path-to-any recordings --other path by goingintosettings and more recording path and change it Correctly.8. If you get "Sorry starting recording failed", please try--otherrecording options like changing sample rate or audiosource.Free version contains ads.PS: Thank you all in advance! I would be grateful to yourratingsand comments. With Automotic Call Recorder Free 2 and Pro 2017, You have theability to have a really awesome audio quality we’re saving thebest to the end : it’s totally free for your phone it’s not a sortof sorcery ! try it & you won’t regret itAppFeatures :UnlimitedCall RecordingRecord your calls automatically while callingRecordsboth incoming and outgoing calls.User can Enable/Disable callrecordingJust use Automatic Call Recorder 2017 its ProRecord allyour phone calls whether it is incoming or outgoing.Delete recordedcall audios.Play or Stop the recorded calls by single touch.Justuse Automatic Call Recorder Pro 2017Automatic phone call recordingbased on predefined rulesON/OFF call recording.Record your call orcalls in MP3, WAV, MP4, AMR or 3GPP encoding / format and HDAppdoes not transfer any content outside your mobile.Configureautomatic cleaning – Can also set the Auto Cleaning time forrecording.Favorite calls list. Permanently stored calls that willnot be deletedConfirmation dialog: Would you like to keep recordedcall that is shown just after the call End.Useful for Secret CallRecording.Completely free no hidden charges.Play, save and delete,call recordingsAutomatic Call Recorder 2017 for your android phoneproCall Recorder pro is the easiest and fastest way to record phonecalls on your android phone.Confirmation dialog: Would you like tokeep recorded call that is shown just after the call EndThanks tothis awesome app you’ll be able to record any incoming and outgoingcall you wantAlso you can chose which calls you want to save &of course you ‘ll enjoy listening to the recordingsYou’ll need touse call recorder in some cases, for example : -Record importantcalls that you’ll need in the future -save the conference call withyour co-workers so you can use it as a reference document -recordyour phone interviews as a futur reference-the best for capturingyour important callsDOWNLOAD IT NOW ! IT’S TOTALLY FREE ! AutomaticCall Recorder 2017 is the best. If you want a phone call record free app which offers HQrecordings, we are the right app for you! Call recorder automaticrecords every single one of your calls. It is one of the best callrecorder for android. It is all call recorder automatic without anyinterruptions. *Phone CALL Recorder*Call recorder apps that do notinterrupt anything and simply record are perfect for any type ofuse. Automatic Call Recorder Pro will simply work in the backgroundwhile recording phone calls that you make or take. *How to recordPHONE Calls*If you ever asked yourself how to record a phone call,then the answer is simple. Download this app, activate it and thatis it! 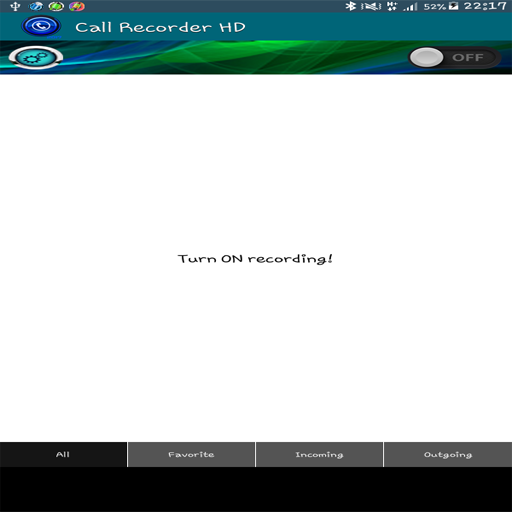 *One of the best phone RECORDER apps*We worked really hard tomake it one of the best, easy to use and ultra-hq record call apps.All recordings are store within the app and can be listened orpreviewed at any time. *Record MY call*If your desire is to recordyour calls, the app with its simplicity will record anything youtalk with your contacts. *Store of RECORDINGS*All recordings areautomatic and all recordings are stored within the app. You canlisten to them, share them or simply delete them. *Automatic CallRecorder Pro FEATURES*- recording of all calls is enabled with onetap- battery and RAM friendly- light in size- all recordings arestored within the app- all call recordings can later be played,shared or deletedWith Automatic Call Recorder you will always haveevery call in your phone and you can use them as you want. Neverforget or get outplayed by someone simply because you didn’t have arecording of the call! HD Automatic Call Recorder Pro App istheleading application support you Automatic Call Recorder Prowithhigh quality.Auto Call Recorder Pro is a Auto Call Recorder Hidden Free. Itisone of the best call recorders application in the Store.This Call Recorder Pro automatic is specifically designed tohelpconsumers to record their calls with service providers so theycanhandle with nasty situations easily.This Auto Call Recorder Unlimited App is a great for yourandroidmobile and tablet.You can use Digital Call Recorder App to make and record nationalorinternational calls from any Android device includingtablets.Record Phone Calls records any phone call you want and choosewhichcalls you want to save. You can set which calls are recordedandwhich are ignored. Listen to the recording, add notes and shareit.Integration with Google Drive™ and Dropbox allows calls to besavedand synchronized to the cloud as well.HD Auto Call Recorder app is a must nowadays. If you searchedforAll Call Recorder app, The Call Recorder - ACR app is a must.Withits light and beautiful design and the intuitiveness you willenjoyevery day using Auto call recorder application.Free Call Recorder Automatic App automatically records whilecallingall incoming and outgoing calls you made from yourphone.Recorded calls are stored in the inbox. Integration withDropboxallow calls to be saved and synchronized to the cloudaswell.Simple Call Recorder app is a simple and smart Call recordingappfor android to easily record a telephone call from both sideswithclear voice anytime. Never worry about losing importantcallrecordings. 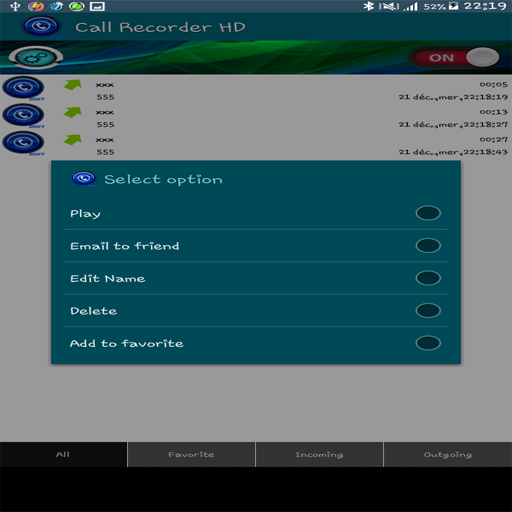 Record and share call recording with ease with freespycall recorder app.Call recorder app for android phone is free unlimited app torecordincoming and outgoing calls.Top Features of HD Automatic Call Recorder Pro :- Records any Incoming & Outgoing calls in HDvoiceQuality- Automatic real-time recording, the sound is very clear onbothsides.- The sound is very clear, no noise, good sound quality.- The incoming and outgoing calls can be recorded, will notbelost.- Strong and stable core compact- Support most models.- Totally free.Does your friend not keep their promises made on the phone? Now,youcan do smart recording automatically with this great Phonecallrecorder app.Record the phone call you want with Automatic Call Recorder Pro.Youcan easily set the calls you want to record and the calls youwantto ignore. Once recorded it is very easy to get to a recordingandlisten to it by a single click, this is key to this AutoCallRecorder Pro compare to other ones where you have to clickseveraltimes to listen to a recording. 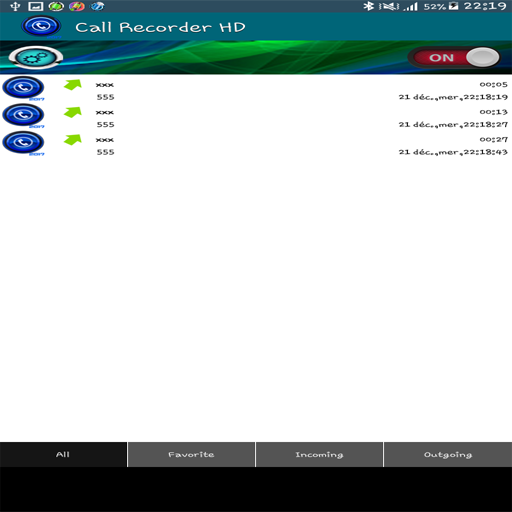 This Auto Call RecorderHidden Freeis designed for people who do not want to waste time,within thelist of recordings you can switch from one recording toanotherreally fast, listen to the first seconds and get to anotherone inno time.Call Recorder Pro automatic is intended for automatic callrecordingfrom the phone line where supported by hardware andkernel. Callrecording is a very device specific feature, becausemanufacturersoften don’t implement the required functionality onthe system levelas they have to.Auto Call Recorder Unlimited app provides a free auto telephonecallrecorder & more features like share, play, delete andrenamecall recordings, multiple audio format, add to favoritesetc. Enjoyfree call recording with Digital Call Recorderapp!Never let recordings slip and never let your phone suffer becauseofan Record Phone Calls app.We are always working on further features to make the HD AutoCallRecorder app better and more useful for your Call Recordingneeds.Don’t hesitate to contact us if there is anyWhat are you waiting for ! 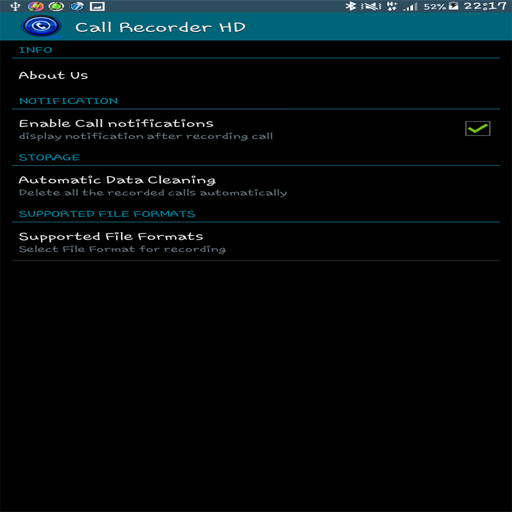 download HD Automatic Call RecorderProApp now !!!! The New Call Recorder 2017 free Its SmartAppto recorder all you call with HD quality. Its one of thebestapplication for this year and i advice you to try it. Trust meYouwill love it .. It's effortless years.Record any incoming and outgoing phone call you want andchoosewhich calls you want to save. You can set which calls arerecordedand which are ignored. Listen to the recording..App Feature:* Records both incoming and outgoing calls. * Unlimited Call Recording* Record all your phone calls whether it is incomingoroutgoing. * User can Enable/Disable call recording* Play or Stop the recorded calls by single touch. * Delete recorded call audios. * Configure automatic cleaning – Can also set the AutoCleaningtime for recording. * Completely free no hidden charges. * Record phone calls from your phone* Save your recordings on your SD card* Use it on the road to capture important calls.What are you waiting for ! Download nowRemember best wishes with Call Recorder 2017.The New Call Recorder2017free Its Smart App to recorder all you call with HD quality.Its oneof the best app for this year and i advice you to try it.Trust meYou will love it .. It's effortless years.Any record incoming and outgoing phone call you want andchoosequi calls you want to save. You can set calls are qui quiRecordedand are ignored. Listen to the recording ..App Feature:* Records Both incoming and outgoing calls. * Unlimited Call Recording* Record all your phone calls whether it is incomingoroutgoing. * User can Enable / Disable call recording* Play or Stop the Recorded calls by single touch. * Delete Recorded audio call. * Configure Automatic cleaning - Can aussi set the AutoCleaningtime for recording. * Completely free no hidden costs. * Record phone calls from your phone* Save your recordings on your SD card* Use it on the road to capture significant calls.What are you waiting for! Download nowRemember best wishes with Call Recorder in 2017.